Although at first glance Frank might seem to be just a jolly, relatively inoffensive fellow, he fulfills the Bruiser role quite efficiently. Possessing a cannon (think Lady DMC4), with various modules for spicing it up, Frank can be quite an opponent. 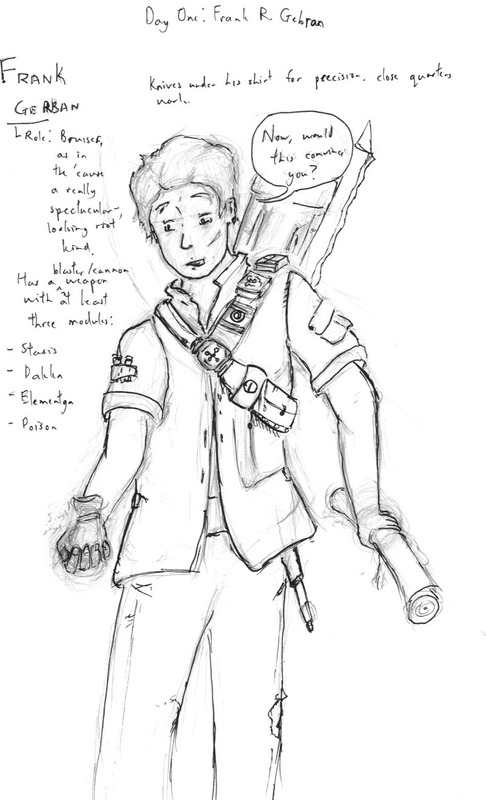 He is a treasure hunter, with a bit of supernatural thrown into the mix, but who’s to complain about that these days? And anyway, vicious spirits bent on revenge are better that what humans can and will do anyway. Yes, I messed up on the anantomy. No I don’t care for the moment (I lie). Interesting concept; I like the tool sash.